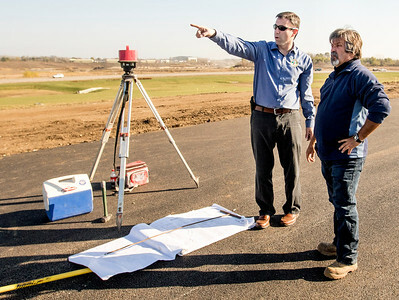 Sarah Nader- snader@shawmedia.com Michael Peranich (left), Lake in the Hills Airport manager, and Ron Renkiewicz of Maneval Construction look at the constriction progress at the Lake in the Hills Airport Wednesday, Nov. 16, 2016. The airport is wrapping up a $2.3 million taxiway project in the next week. 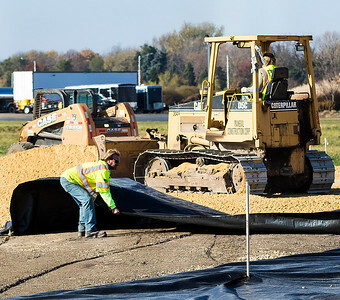 Sarah Nader- snader@shawmedia.com Maneval Construction employees work on adding a base layer in preparation for the asphalt on the runway at the Lake in the Hills Airport Wednesday, Nov. 16, 2016. The airport is wrapping up a $2.3 million taxiway project in the next week. 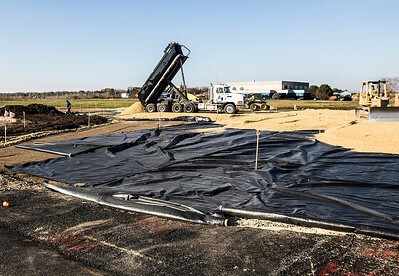 Maneval Construction employees work on adding a base layer in preparation for the asphalt on the runway at the Lake in the Hills Airport Wednesday, Nov. 16, 2016. The airport is wrapping up a $2.3 million taxiway project in the next week.